This article is about glacial sediments. For other uses, see Till (disambiguation). Closeup of glacial till. Note that the larger grains (pebbles and gravel) in the till are completely surrounded by the matrix of finer material (silt and sand), and this characteristic, known as matrix support, is diagnostic of till. Till or glacial till is unsorted glacial sediment. Till is derived from the erosion and entrainment of material by the moving ice of a glacier. It is deposited some distance down-ice to form terminal, lateral, medial and ground moraines. Till is classified into primary deposits, laid down directly by glaciers, and secondary deposits, reworked by fluvial transport and other processes. Glacial drift is the coarsely graded and extremely heterogeneous sediment of a glacier; till is the part of glacial drift deposited directly by the glacier. It's content may vary from clays to mixtures of clay, sand, gravel, and boulders. This material is mostly derived from the subglacial erosion and entrainment by the moving ice of the glaciers of previously available unconsolidated sediments. Bedrock can also be eroded through the action of glacial plucking and abrasion and the resulting clasts of various sizes will be incorporated to the glacier's bed. Eventually, the sedimentary assemblage forming this bed will be abandoned some distance down-ice from its various sources. This is the process of glacial till deposition. When this deposition occurs at the base of the moving ice of a glacier, the sediment is called lodgement till. Rarely, eroded unconsolidated sediments can be preserved in the till along with their original sedimentary structures. More commonly, these sediments lose their original structure through the mixture processes associated with subglacial transport and they solely contribute to form the more or less uniform matrix of the till. Till is deposited at the terminal moraine, along the lateral and medial moraines and in the ground moraine of a glacier. As a glacier melts, especially a continental glacier, large amounts of till are washed away and deposited as outwash in sandurs by the rivers flowing from the glacier, and as varves (annual layers) in any proglacial lakes which may form. Till may contain detectable concentrations of gems or other valuable ore minerals picked up by the glacier during its advance, for example the diamonds found in the U.S. states of Wisconsin, Indiana, and in Canada. Prospectors use trace minerals in tills as clues to follow the glacier upstream to find kimberlite diamond deposits and other types of ore deposits. 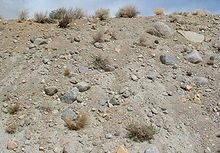 In cases where till has been indurated or lithified by subsequent burial into solid rock, it is known as the sedimentary rock tillite. Matching beds of ancient tillites on opposite sides of the south Atlantic Ocean provided early evidence for continental drift. The same tillites also provide some support to the Precambrian Snowball Earth glaciation event hypothesis. secondary deposits – reworked by fluvial transport, erosion, etc. Traditionally (e.g. Dreimanis, 1988) a further set of divisions has been made to primary deposits, based upon the method of deposition. Lodgement tills – sediment which has been deposited by plastering of glacial debris from a sliding glacier bed. Deformation tills – Sediment which has been disaggregated and (usually) homogenised by shearing in the sub glacial deformed layer. Melt out tills – Released by melting of stagnant or slowly moving debris-rich glacier ice and deposited without subsequent transport or deformation. Split up into sub glacial melt out till (melting of debris rich ice at the bottom of the glacier) and supraglacial melt-out till (melting of ice on the glacier surface). Sublimation till – similar to melt out till, except the ice is lost through sublimation rather than melt. Often occurs only in extremely cold and arid conditions, mainly in Antarctica. Van der Meer et al. 2003 have suggested that these till classifications are outdated and should instead be replaced with only one classification, that of deformation till. The reasons behind this are largely down to the difficulties in accurately classifying different tills, which are often based on inferences of the physical setting of the till rather than detailed analysis of the till fabric or particle size. Look up till in Wiktionary, the free dictionary. Wikimedia Commons has media related to Till. ^ Meer, J.J.M. van der, Menzies, J. and Rose, J. 2003. Subglacial till: The deforming glacier bed. Quaternary Science Reviews 22, pp. 1659–85.